Last major update issued on March 18, 2004 at 04:55 UTC. Minor update posted at 07:24 UTC. The geomagnetic field was quiet to unsettled on March 17. Solar wind speed ranged between 360 and 473 km/sec. Solar flux measured at 20h UTC on 2.8 GHz was 109.8. The planetary A index was 6 (STAR Ap - based on the mean of three hour interval ap indices: 7.0). Three hour interval K indices: 12122321 (planetary), 22113322 (Boulder). At midnight there were 6 spotted regions on the visible disk. Solar flare activity was low. A total of 4 C class events was recorded during the day. Region 10570 was quiet and stable, the region is rotating out of view at the southwest limb. Region 10572 decayed quickly and became spotless late in the day. 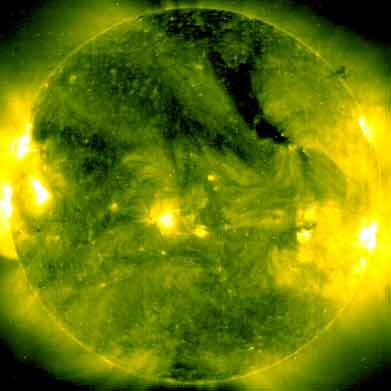 Flare: C1.6 at 09:31 UTC. This event appears to have been associated with a small CME and a type II radio sweep. Region 10574 developed quickly with both negative and positive polarity flux emerging. The region is complex with a high degree of polarity intermixing and possibly a magnetic delta structure in the largest (trailing) penumbra. M class flares are possible. Flares: C1.5 at 08:09, C2.5 at 14:27 and C1.3 at 18:12 UTC. New region 10575 emerged in the southeast quadrant on March 16 and was numbered the next day by SEC. The region was decaying late in the day and early on March 18 no spots could be seen. New region 10576 emerged in the southwest quadrant. New region 10577 rotated into view at the southeast limb. The region may have some trailing spots further southeast, or maybe there is another region about to rotate into view at the southeast limb. Comment added at 07:24 UTC on March 18: Region 10574 was the source of an M1.6 flare at 05:17 and a C8.0 flare at 06:15 UTC. A region at the northeast limb produced a C1.4 flare at 01:33 and a C3.7 flare at 06:05 UTC. Region 10574 currently has two magnetic delta structures, one in the main (trailing) penumbra and one in a central penumbra. 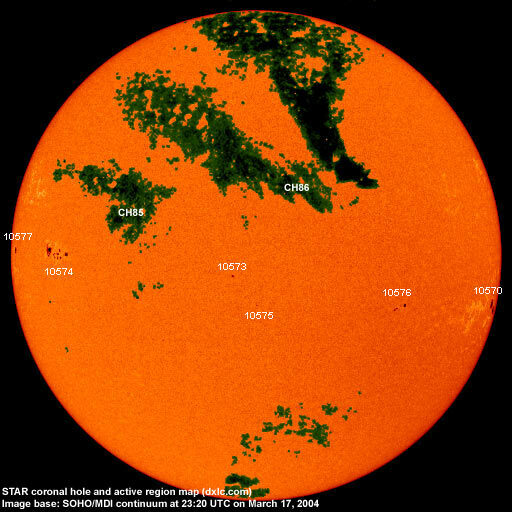 Region 10576 is becoming interesting as well and could soon develop a magnetic delta structure. 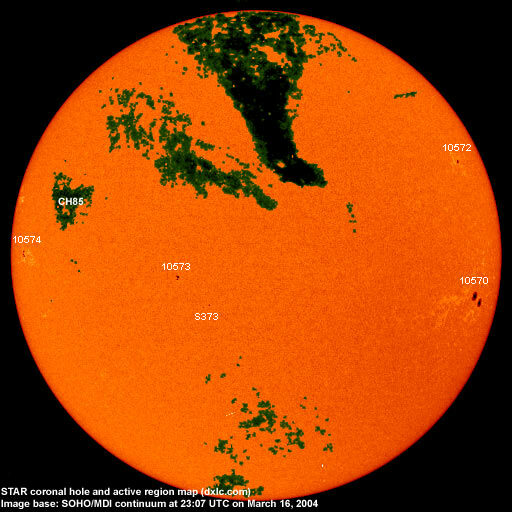 March 15 and 17: No partly or fully earth directed CMEs observed. March 16: A CME was observed off of the northwest limb (first in LASCO C3 at 17:18 UTC) following a long duration event just south of region 10572. Within 3 hours faint ejecta was observed all around the disk, thus this could be a full halo CME. If it is a weak CME impact could be observed on March 19 or 20. A recurrent, poorly defined coronal hole (CH85) in the northern hemisphere will rotate into a possibly geoeffective position on March 20. The geomagnetic field is expected to be mostly quiet to unsettled on March 18-21. A weak CME impact is possible on March 19 or 20 and could cause unsettled to active conditions. Long distance low and medium frequency (below 2 MHz) propagation along east-west paths over high and upper middle latitudes is poor. Propagation along long distance north-south paths is fair to poor. [Trans Atlantic propagation conditions are currently monitored every night on 1470 kHz. Dominant station tonight: Radio Vibración (Venezuela). Otherwise the best TA signal was from Rádio Uirapurú (Brazil) on 760 kHz]. 10574 2004.03.16 18 27 S02E56 0110 DSI beta-gamma-delta?